I've wanted to read Ice, by Anna Kavan, ever since I read about that troubled writer in Doris Lessing's collection of essays, Time Bites. It's been a hard book to find, but it's suddenly available here and there (get your copy now), having been recently (2006) reissued (three cheers for independent publishers, but I do wish they'd invest in a proofreader — on the spine the author's name is spelled "Ann" without the final "a"). I'm not altogether sure what to make of it, but it is weirdly beautiful. The unaccustomed cold made my head ache as I stared out, straining my eyes in the effort of trying to avoid icy patches, where the car skidded out of control. When the headlights fled over the roadside ruins from time to time, the brief glimpse always surprised me, and vanished before I was sure I had really seen it. An unearthly whiteness began to bloom on the hedges. I passed a gap and glanced through. For a moment, my lights picked out like searchlights the girl's naked body, slight as a child's, ivory white against the dead white of the snow, her hair bright as spun glass. She did not look in my direction. Motionless, she kept her eyes fixed on the walls moving slowly towards her, a glassy, glittering circle of solid ice, of which she was the centre. Dazzling flashes came from the ice-cliffs far over head; below, the outermost fringes of ice had already reached her, immobilized her, set hard as concrete over her feet and ankles. I watched the ice climb higher, covering knees and thighs, saw her mouth open, a black hole in the white face, heard her thin, agonized scream. I felt no pity for her. On the contrary, I derived an indescribable pleasure from seeing her suffer. I disapproved of my own callousness, but there it was. This passage came out of nowhere (the first of many instances like this). The narrator is driving along a road, and suddenly we veer right off, but only for a paragraph or two, and the story picks up again where we'd left off. Is this deviation from reality a dip into his imagination, or his own psychological problems, or a poeticized version of his haunted reality? And what is this ice, then? A symbol or metaphor? Of what? the girl? the relationship? the world? What? I was frustrated by this novel early on — had no idea what was going on — even while the language danced hypnotic circles around me. One day on the metro, I found myself formulating the thought, "I don't have time for 'difficult' novels." Of course, I don't really mean that; but every now and then I have to question why someone would choose to eschew typical narrative patterns, when they would serve the purpose equally well. Now, I'm sure there is, in fact, another purpose. And it's only pretentious on the part of the artist when I don't get it. Anyway, here I was, reading on the metro, not fully getting it. The only way I could describe this book is "trippy" (the more literary among you may prefer the term "slipstream"). And I was a bit pissed off about about not getting it. I happen to like, have always liked, "hard" books. Am I so out of practice? Are my hard books not challenging me enough? Have I deluded myself in my belief that my reading interests are open-minded and far-reaching? I'm a far better reader now than I was 20years ago, thanks to my experience in reading and in life — was this book so far beyond both? But a funny thing happened. It started to come together. Whether it's because I'd been out of the habit of this kind of challenge and it took a few days to warm up those muscles, or because the narrative style took a turn, I can't say. But things became more obvious toward the end. Doris Lessing said, "This Ice is not psychological ice or metaphysical ice; here the loneliness of childhood has been magicked into a physical reality as hallucinatory as the Ancient Mariner's." Ice is not the sf dytopian novel I was expecting. The end of the world serves as a backdrop; apart from whatever metaphor or poetic imagery it may serve, the ice that is descending upon the world allows for chaos, an imbalance in the social and political structures, allowing these characters to move and act as they do. I'm not sure I'd categorize Ice as dystopian at all (much the same way I don't think McCarthy's The Road qualifies; the wasteland setting is an accident of circumstance, even if essential to propel the characters, but the book's not about that); it's a book about a dysfunctional relationship. Ice is about a girl and the narrator, their past locked into their present, with no hope of a future. Then there's the other man, who may be that side of the narrator he doesn't like to look at square on. In an indescribable way our looks tangled together. I seemed to be looking at my own reflexion. Suddenly I was entangled in utmost confusion, not sure which of us was which. We were like halves of one being, joined in some mysterious symbiosis. I fought to retain my identity, but all my efforts failed to keep us apart. I continually found I was not myself, but him. At one moment I actually seemed to be wearing his clothes. I fled from the room in utter confusion: afterwards did not know what had happened, or if anything had. Elsewhere: The Times Literary Supplement, and a more scholarly take. Personally, I did not know what had happened, or if anything had. Before I could answer (if I could have answered so difficult a question at all), she repeated, "Love her, love her, love her! If she favours you, love her. If she wounds you, love her. If she tears your heart to pieces — and as it gets older and stronger, it will tear deeper — love her, love her, love her!" Never had I seen such passionate eagerness as was joined to her utterance of these words. I could feel the muscles of the thin arm round my neck, swell with the vehemence that possessed her. "Hear me, Pip! I adopted her to be loved. I bred her and educated her, to be loved. I developed her into what she is, that she might be loved. Love her!" She said the word often enough, and there could be no doubt that she meant to say it; but if the often repeated word had been hate instead of love — despair — revenge — dire death — it could not have sounded from her lips more like a curse. "I'll tell you," said she, in the same hurried passionate whisper, "what real love is. It is blind devotion, unquestioning self-humiliation, utter submission, trust and belief against yourself and against the whole world, giving up your whole heart and soul to the smiter — as I did!" — from Great Expectations, by Charles Dickens. Pretty powerful when told to you by Hugh Laurie amid a crowd of strangers on the metro platform at 8 in the morning. This book is gorgeous. 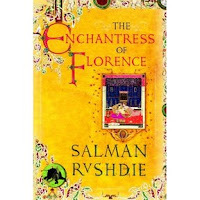 The Enchantress of Florence, by Salman Rushdie, casts quite a spell. I've never read a novel of Rushdie's before (though his editorials are of great interest and I greatly admired his performance in Bridget Jones' Diary), nor have I ever felt particularly inclined to. Something about this book, though, drew me to it. It's been a long time since I was excited about a book's glorious physicality. It's a completely subjective experience, and my impression is one I'm entirely unable to explain, but I think this book as physical object is beautiful, and I want to fondle it, turn it over and over and over. The dust jacket is yellow and orange-red, the colour of spice, and it makes me hungry. Its design is a weird mix of Florentine flourish and orientalist illumination. The most striking element, to me, is the endsheets — a minor detail, but one that has me exclaiming, "Look at this! Isn't this book beautiful?!" Beautiful! As for the story, it's magical and riveting. I've had a hard time putting it aside. It's been the perfect complement to my reading of Amir Hamza, similar in flavour, but more modern (read: accessible) in its language and pacing — and I was thrilled to see the great hero referenced herein — and to the family's recent viewing of Sinbad movies. There's nothing I love so much as a vaguely middle-eastern mystical mythical adventure romance. Pirates! A mysterious ambassador! Brothels! Secrets! An imaginary queen made real! Revenge! A forgotten princess! A painting the painter hides himself in! Vampires (and none other than Vlad Dracula himself)! Tulip superstitions! The four Swiss albino giants (Otho, Botho, Clotho, and D'Artagnan)! Macchiavelli! A magic mirror! Screaming mandrake roots! Behind the fabulous stories is a philosophical exploration of being in the world. The emperor Abul-Fath Jalaluddin Muhammad, king of kings, known since his childhood as Akbar, meaning "the great," and latterly, in spite of the tautology of it, as Akbar the Great, the great great one, great in his greatness, doubly great, so great that the repetition in his title was not only appropriate but necessary in order to express the gloriousness of his glory — the Grand Mughal, the dusty, battle-weary, victorious, pensive, incipiently overweight, disenchanted, mustachioed, poetic, over-sexed, and absolute emperor, who seemed altogether too magnificent, too world-encompassing, and, in sum, too much to be a single human personage — this all-engulfing flood of a ruler, this swallower of worlds, this many-headed monster who referred to himself in the first person plural — had begun to meditate, during his long, tedious journey home, on which he was accompanied by the heads of his defeated enemies bobbing in their sealed earthen pickle-jars, about the disturbing possibilities of the first person singular — the "I." The interminable days of slow equestrian progress encouraged many languid wonderings in a man of speculative temperament, and the emperor pondered, as he rode, such matters as the mutability of the universe, the size of the stars, the breasts of this wives, and the nature of God. Also, today, this grammatical question of the self and its Three Persons, the first, the second and the third, the singulars and plurals of the soul. 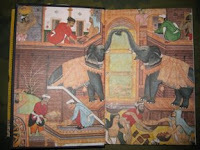 He, Akbar, had never referred to himself as "I," not even in private, not even in anger or dreams. He was — what else could he be? — "we." He was the definition, the incarnation of the We. He had been born into plurality. When he said "we," he naturally and truly meant himself as an incarnation of all his subjects, of all his cities and lands and rivers and mountains and lakes, as well as all the animals and plants and trees within his frontiers, and also the birds that flew overhead and the mordant twilight mosquitoes and the nameless monsters in their underworld lairs, gnawing slowly at the roots of things; he meant himself as the sum total of all this victories, himself as containing the characters, the abilities, the histories, perhaps even the souls of his decapitated or merely pacified opponents; and, in addition, he meant himself as the apogee of his people's past and present, and the engine of their future. There are human mirrors. Doubles. Reflections. East and west. Counterparts comprising a whole. Dream, reality. God, man. Plot parallels and situational analogues. There is great awe of women and the mysterious power of the feminine that holds sway over even emperors. Sometimes in the woods near the farm in Percussina he lay on the leaf-soft ground and listened to the two-tone song of the birds, high low high, high low high low, high low high low high. Sometimes by a woodland stream he watched the water rush over the pebbled bed, its tiny modulations of bounce and flow. A woman's body was like that. If you watched it carefully enough you could see how it moved to the rhythm of the world, the deep rhythm, the music below the music, the truth below the truth. He believed in this hidden truth the way other men believed in God or love, believed that truth was in fact always hidden, that the apparent, the overt, was invariably a kind of lie. Because he was a man fond of precision he wanted to capture the hidden truth precisely, to see it clearly and set it down, the truth beyond ideas of right and wrong, ideas of good and evil, ideas of ugliness and beauty, all of which were aspects of the surface deceptions of the world, having little to do with how things really worked, disconnected from the whatness, the secret codes, the hidden forms, the mystery. Here in this woman's body the mystery could be seen. 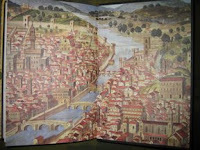 There are pages of bibliographic references at the novel's close, among which is listed Calvino's Italian Folktales. A good reason to pull that one down off the shelf for a revisit. "The Hindustani storyteller always knows when he loses his audience," he said. "Because the audience simply gets up and leaves, or else it throws vegetables, or, if the audience is the king, it occasionally throws the storyteller head-first off the city ramparts. And in this case, my dear Mogor-Uncle, the audience is indeed the king." They may walk or run, cycle, row, sail, fly, blast off — or use any one of hundreds of other possible vehicles. Or they may sit quietly, day after day, in a room. Because they write about the places they have been — whether in memory or in their imagination, they allow the rest of us a way of traveling too, guiding us through regions, galaxies, eras, cultures and states of mind, strange or familiar or some combination of the two. The 2008 Blue Metropolis International Literary Grand Prix is being awarded to French writer Daniel Pennac, who writes both for children and for adults. The festival programme is now online. I endeavour to be in town for the festival and not pressed by work deadlines. I've managed to attend only twice in the years I've lived here (no matter how often I blog about it). I'll examine the listings more closely later. Currently, Daniel Levitin (Your Brain on Music) stands out, and maybe Robert J Sawyer, who does have some interesting ideas about all sorts of interesting things, even if I do think he's a crappy writer. And sometimes I need to be reminded of it. "There is water at the bottom of the ocean." This is one of the very first songs I loaded onto my recently acquired MP3 player. If there's a song I should have at the disposal of my auditory apparatus, yielding to the control exerted by my little finger, available to me at all times and forever, this is it. Having come to the end Chapter 11 of Great Expectations, being all that I'd foreseen to load, I find myself waiting for a train and having to listen to — gasp! — music. (The audiobook listening on my daily commute is immensely enjoyable, by the way. I will continue with this book, and I will find others. But this is "reading" to be entertained and distracted. I will not expect an audiobook to change my life, nor that I remember it for very long.) Music! I stand there, toe tapping, body swaying. I feel conspicuous. I restrain myself from humming, but it takes a great deal of effort. I smile. I feel like I have a secret. (I have a few secrets. I am mystified that for all the wired heads I see riding the metro, more people aren't tapping their toes, swaying their bodies, restraining their hums. Have we lost (are we being trained to lose) the capacity to feel the music? Perhaps this is why I listen to music so relatively little: it carries me away too easily.